As we move through advent, the growing light renews our hope in Immanuel - God-with-us. Over and over in the scriptures, we hear the words "do not be afraid," and usually those words are followed by the reassurance: "I am with you." If God is for us, who can be against. 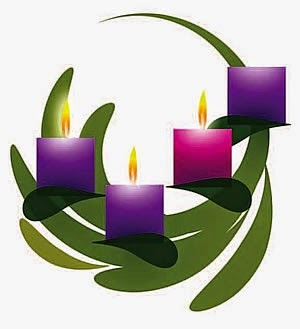 I find the presence of God in the flickering candles on the advent wreath that dare to pierce the darkness. I find the presence of God in the flickering of hope in the dark places in my own life. I find the presence of God in the stirring of embers long grown cold, in the random acts of kindness by friend and strangers. I find the presence of God in the whispers of goodness that abound in this particular season. I find the presence of God in the growing solidarity of people to work for the coming of Immanuel, for the coming of peace to every corner of our weary world, for the coming of hope and justice, for the coming of joy to longing hearts. I just read Sebastian Junger's Tribe. I had a little problem with the many illustrations from the military. However the book highlights the basic human instinct for community. He describes our current society's loss of community. Junger cites our evolutionary adaptation to tribal living. Tribes gathered because the prehistoric world was terribly inhospitable. A single individual could hardly survive in that world. People come together to share life together, to support one another, to need others and to be needed by them. We are evolved to cooperate and support one another. Our current society tends to isolate us into individuals and this isolation is in deep conflict with our fundamental sense of well-being. Religious communities tap into this deep human need and help us to live more healthy and well adjusted lives. Community is also a challenge - it demands that we face the consequences of our choices - both good and bad. Much of this book's message resonates with my own experience of community which has been such a blessing as well as a challenge to personal growth over the years.